There are many scenically stunning golf courses around England’s long coastline but there are none more glorious than Bamburgh Castle. Its elevated cliff top site provides a natural platform from which to drink in the 360-degree views and also the topography provides for some truly memorable holes. We think Bamburgh Castle has a unique opening series of holes, at least we can’t think of any course that starts with two back-to-back par threes followed by two par fives. 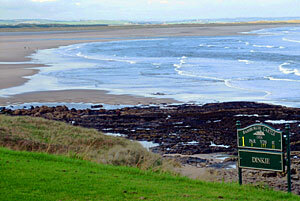 According to the R&A Golfer’s Handbook, George Rochester originally fashioned Bamburgh Castle. The course opened for play in 1904 and was apparently later revised, but the vast majority of this 5,621-yard par 68 layout remains as it was back in the times of Bernard Darwin all those years ago… including the warm welcome in the old pavilion styled clubhouse. Bamburgh Castle has had lots of varying reviews, and as with many similar courses this indicates that it is a course worth visiting and making your own mind up. Personally I love the course for its scenery, elevation changes and sheer fun. It's a sporting course that would never be made these days. Often we play a traditional course and compare a hole to one at Bamburgh, particularly if it has an elevated tee playing across broken ground to a green nestled amongst rocks - superb fun ! It's a quick, great value, supremely enjoyable game of golf to be included in any itinerary in the area or if heading up to or back from Scotland. Not to be missed. I've played Bamburgh a handful of times now over the years, and it remains one of my favourite courses in the country. It is the epitome of what golf should be about - natural, fun and transportive. Yes, it is short, but never boring, and I don't have much truck with people who measure the test of a golf course on its length anyway. And if you play here when there's a 4 club wind (which there often is!) you will have played magnificently if you've played to handicap. If there is a course with better views in British golf, I'd like to know about it! Surely worthy of nudging ahead of some of the unremarkable tracks languishing near the bottom of the English Top 100? Bamburgh Castle most definitely falls into the ‘odd sock drawer’ of golf courses… and that’s a good thing! Sporty in nature this entertaining course was in fantastic condition towards the end of February 2015. It’s an unusual course and whilst I don’t think I would personally wish to play it ‘week-in and week out’ my first round here was highly enjoyable and I would return to play again without any hesitation. It is very much what I would class as ‘old fashioned’ golf. The terrain is undulating which requires a lot of shot-making and the course boasts exceptionally fine turf; although not a true links it certainly walks and talks like one on many of the holes. The views along the Northumberland Coast and across the sandy beaches out to the North Sea are simply breathtaking too. The oddities start from the off as you commence the round with two par three’s followed immediately by two par fives! I only found this out for sure after my round because it was a windy day and the scorecard I picked up from the recently refurbished clubhouse was already drifting out to sea by the time I had reached the first green. Played this course last week. Thought I was going to enjoy it as I love courses with views and undulating land and was delighted to have my expectations surpassed.It is true that this is not a championship course. Too short, too many blind shots and too many cross crossing holes for the professionals. These "downsides" were more than compensated by amazing views, good conditioning, a test of all parts of the game, and a genuinely fun mix of holes. This should rank up there with North Berwick and Lahinch in the fun lists in my view. Both my playing partner (casual golfer) and I (handicap 9) thoroughly enjoyed the round despite not playing at our best and with a three club wind.Back to the location - as good as Pebble Beach, Turnberry, Royal County Down and New Sourh Wales. And Lindisfarne to the north and the castle to the south. If only the same quality could be provided by the weather!Favorite holes - 2nd (a driver into the wind! ), the maligned 8th (fair in my opinion), 15th, 16th and 17th. The fact that I can clearly recall all of them is instructive.On the subject of lists, it is outrageous that this is not a top 100 course in the UK (I've played around 60). It is probably in my top ten courses in the world. Fun should clearly be given more weighting by the judges.In short, all expectations were exceeded. Highly recommended. Six stars: No! A decent 3.5 stars and maybe 4 if I'm being generous but Bamburgh is nowhere near as good as Pebble Beach, RCD!! I'm rolling around laughing at the thought. What a stunning golf course Bamburgh Castle is. Played it recently in a VERY strong wind which then makes this relatively short course extemely difficult. Some delightful holes and superb par 3's (of which there are six). The 15th and 16th were played directly into the wind but the views from the 15th and 17th tees were nothing short of fantastic.With the strong prevailing wind I am sure that the 17th and 18th holes have ruined many a good card!! Lovely clubhouse with very friendly staff. All in all an excellent day out. Played Bamburgh today on August Bank Holiday Monday with 3 family members (handicaps of 5, 6, 8 & 11). Fully agree with the previous comments that the views from this course really are superb. We played it on a warm sunny day with a 2-3 club wind. We received a nice warm welcome from the clubhouse and were pleased to be able to play it off the white tees given it is pretty short (5,645 yards - par 68) containing no less than 6 par 3s! Indeed the course starts with 2 par-3s and then 2 par-5s. It's a fun cliff top layout (rather than links) and they make good use of the very undulating land. The greens definitely needed a shave as they were very slow and a bit bumpy but otherwise it was in pretty good nick. The only thing that I didn't enjoy so much was the volume of blind tee shots (maybe 5 or 6) but otherwise it is a good mix of some short par 4s with some challenging par 3s. To sum up... a good fun holiday track but not one that will take your breath away, although the views certainly did. Just came back from a holiday in England and played 9 Top 100 courses ranging form Royal Lytham to the Addington. This brings my total to 45 courses. The first reason to come to Bamburgh was its status of most scenic course in Britain but what a suprise. I love rustic original courses that give you the feeling to play in and against nature. This course is one of the best examples I have seen. Rugged, original, thinking mans course. Of course you are challenged with some unusual features but that's whats it all about. When we played in mid July the winds were very strong, we were blown out of our shoes so to speak. But we ( I play off 7) still managed to get a reasonable score. My good mood must have come from driving a green for the first time in my life (the 18th). I three putted (naturally) but left Bamburgh with a warm and unique memory I will cherish for a long time. Play Bamburgh Castle and find out how good it is. It is not the longest, but has the most spectacular views bettered only by Pebble Beach and Kapalua. Set around Budle Bay with Lindisfarne, The Farne Islands and Bamburgh Castle as a backdrop this is a hidden gem. Although only a par 68 the course record is 64, and when the wind blows 84 is a good crack. I have played this course more than 200 times and never get tired of this beauty. I read the reviews on the morning of August 1st, 2010, then played the course in the afternoon. For me the undoubted magic of this place is the way that the course is hewn out of the characterful land-with the maximum of nature & the minimum of nurture. The basalt rock profoundly shapes the course, standing proud above the surrounding scenary that frames it so magnificently. The gorse-speckled contours create intriguing holes, each bringing a smile to the explorer's face. You might well be able to fault it, but this is surely one of the originals, restoring the rightful balance between nature & the golfer.